Conductor Anne Manson has served as Music Director of the Manitoba Chamber Orchestra since 2008 and recently renewed her contract through 2020. Manson’s strong commitment to contemporary music has led to numerous commissions and recordings with the MCO. Among them are Philip Glass’ Symphony No. 3 and Piano Concerto, and the Juno and Western Canada Music award nominated Troubadour & the Nightingale with soprano Isabel Bayrakdarian. Ms. Manson gave the world premiere of Nanabozho a new bi-lingual music theatre work by composer Michael Oesterle and writer Rhéal Cenerini in collaboration with Cercle Molière Theatre. 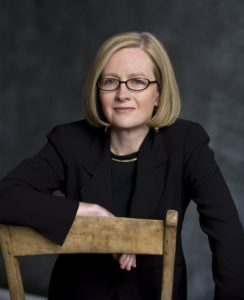 As a guest conductor, she has performed with the Los Angeles Philharmonic, Houston and Indianapolis Symphonies, the Residentie Orchestra of the Hague, the St. Paul Chamber Orchestra, London Philharmonic, the Royal Scottish National Orchestra, Bournemouth Sinfonietta, the Swedish Chamber Orchestra, Orquesta de Extremadura, BBC Proms, and she has guest conducted regularly with many orchestras in Spain. As a renowned conductor of opera, Manson has led at houses around the globe: Così fan tutte for San Francisco Opera, Vanessa for New York City Opera, Carlisle Floyd’s Susanna for Grand Théâtre de Genève, Donizetti’s Viva la mamma for Royal Opera Stockholm, Kat’a Kabanova for Spoleto Festival, the US premiere of Jonathan Dove’s The Adventures of Pinnochio, Maria Stuarda , Tosca and Hänsel und Gretel for Minnesota Opera, Phillip Glass’ Orphée, Galileo Galilei and Madama Butterfly for Portland Opera, Les Pêcheurs de Perles and Orphée aux enfers for Virginia Opera, Vanessa, Conrad Susa’s DANGEROUS LIASONS and Scott Wheeler’s DEMOCRACY for Washington National Opera, as well as serving as a mentor for the American Opera Initiative commissions. She received Canada’s DORA Award for outstanding musical direction for her work with the Canadian Opera Company on A Midsummer Night’s Dream. At the Juilliard School, she has conducted The Cunning Little Vixen, Orphée aux enfers, Dialogues des Carmélites, Ned Rorem’s Our Town, and Peter Maxwell Davies’ Kommilitonen!. Recent engagements include a return to The Juilliard School to conduct Kat’a Kabanova, a third appearance at Spoleto Festival for the season opening concert, San Francisco Opera’s Schwabacher Summer Concert, performances with the Swedish Chamber Orchestra, and a tour of Philip Glass’ new piano concerto with Simone Dinnerstein and the MCO. In addition to recordings with Manitoba Chamber Orchestra and Portland Opera, Manson has recorded with the Residentie Orchestra of The Hague, the BBC Scottish Symphony, the Iceland Symphony, the Singapore Symphony, and the Swedish Chamber orchestra. Manson has recorded both the Philip Glass’ Symphony No. 3 and Piano Concerto with the Manitoba Chamber Orchestra and Glass’ GALILEO GALILEI and ORPHEÉ with Portland Opera. A recording of Baroque concerti with percussionist Evelyn Glennie and the Manitoba Chamber Orchestra will be released in spring 2017. Before serving as the MCO’s Music Director, Manson was Music Director of London’s Mecklenburgh Opera (1987-96) and the Kansas City Symphony (1999-2004). She was the first woman to lead the Vienna Philharmonic at the Salzburg Festival in 1994 when she conducted performances of BORIS GODUNOV.